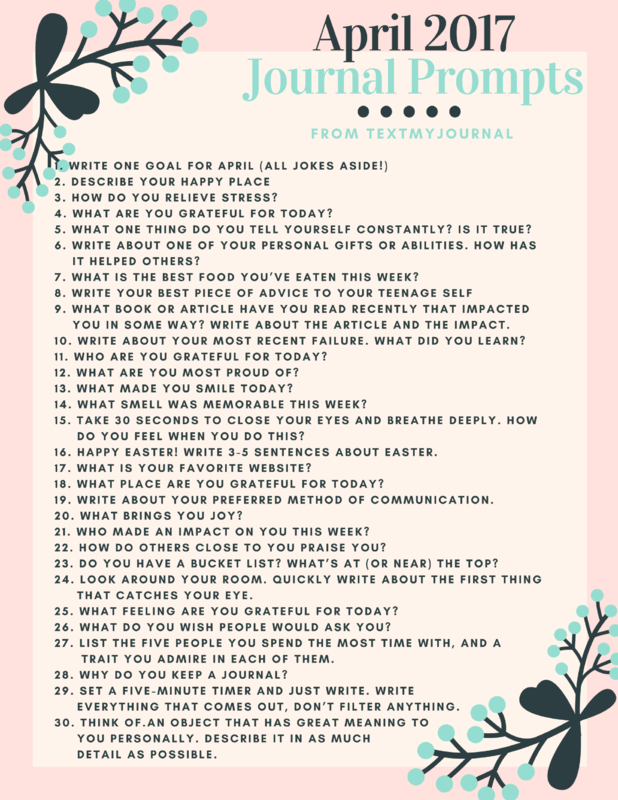 April Journal Prompts are ready! Yes, we’re a bit in shock over here that it’s already April. You too? Phew! Glad it’s not just us! We hope you enjoyed the quotes in March. It was definitely an inspiration to our team, and we hope you felt just as motivated to change the world. We’re looking forward to major upgrades within our system this month, many of which were inspired by feedback from journalers like you! Thanks for your support and encouragement as we are always seeking to improve! From the TextMyJournal family to you, please enjoy our April journal prompts! What one thing do you tell yourself constantly? Is it true? Write about one of your personal gifts or abilities. How has it helped others? What is the best food you’ve eaten this week? What book or article have you read recently that impacted you in some way? Write about the article and the impact. Write about your most recent failure. What did you learn? What smell was memorable this week? Take 30 seconds to close your eyes and breathe deeply. How do you feel when you do this? Happy Easter! Write 3-5 sentences about Easter. What place are you grateful for today? Write about your preferred method of communication. Who made an impact on you this week? How do others close to you praise you? Do you have a bucket list? What’s at (or near) the top? Look around your room. Quickly write about the first thing that catches your eye. What feeling are you grateful for today? What do you wish people would ask you? List the five people you spend the most time with, and a trait you admire in each of them. Set a five minute timer and just write. Write everything that comes out, don’t filter anything. Think of an object that has great meaning to you personally. Describe it in as much detail as possible.